By now, it’s likely that you all understand the true importance of a first impression. However, how do you nail your first impression, sell yourself during an interview, and manage not to sound arrogant? We have a few tips to teach you, so keep reading to find out! Dress: Your physical presentation will almost always be the first thing your interviewer sees. Make sure that your clothing fits well, is appropriate for the interview, is relatively dark in color, and is ironed. Monitor jewelry, accessories, tie design, makeup, and hairstyle. A clean, simple look will help you appear professional without being overbearing. Tone: The tone you exhibit to the person interviewing you is a key component of your first impression. Express enthusiasm, excitement, confidence, and no arrogance! On a separate note, make sure that the tone you use when speaking about yourself and your own accomplishments helps you appear prideful, but still humble. 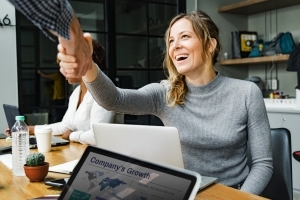 Warm Body Language: Offer a firm handshake, maintain direct eye contact, greet with a smile, and be mindful of the way you say hello (positive, upbeat tone). Be conscious of posture, arms (folding in front appears cold and secretive), and subconscious habits (ie: foot tapping). Audience Focused View: Remembering staff members names, contact information, or personal information about the interviewer that you have been previously provided showcases your dedication, enthusiasm, and care. Active Listening: Always listen to your interviewer! This rule applies to any professional, personal, or academic setting. Most of us are focused on ourselves, however, it’s time to start focusing on someone else. Remember key information, advice, stories you are told, or any information you are provided on the other end. Make your interviewer feel as valued and important as you possibly can! Timeliness: As we’ve said in the past… if you’re on time, consider yourself late! Always arrive early to an interview. Not only will this showcase respect, but it will allow time for you to collect yourself and prepare for a few extra moments. Stories Instead of Scripts: While we firmly believe that each interviewee should come prepared with a few key stories in their back pocket, you must avoid sounding scripted. It is obvious to any interviewer when a candidate is repeating stories they’ve rehearsed in the mirror one hundred times; doing so will damage your first impression. We encourage you to remember a story “outline”, but elaborate and add details during the interview that will help you come across as your truest self. Focus on Yourself… AND Others! Celebrating your own accomplishments is equally as valuable as crediting others. This showcases your modesty, collaborative skills, and value in teamwork. Honesty: We all have imperfections! There is not an interviewer in the world who expects their candidates to nail every qualification and interview question. With that being said, always maintain honesty in your answers. Slightly fibbing up a story to boost your qualifications and experiences will only work against you. A key component of selling yourself is being honest with yourself, knowing who you are, and knowing what you need to work on. Natural Body Language: It is easy to nervously try and appear super confident, often by leaning in too close to an interviewer, speaking too loudly, or overusing hand gestures. Be mindful of the way you hold yourself; sit up straight, lean in slightly, and use gestures if truly valuable in illustrating an experience. Do Your Research: Having a general understanding of the company culture before entering an interview will aid your success immensely! Sell yourself by catering to the needs of the organization, their mission, and their values. Try to identify the ways employees interact with each other, with their bosses, and the formality (or lack thereof) of the firm. At Esquire, we consider ourselves interview pros! Check out our article to learn about the most commonly asked interview questions.